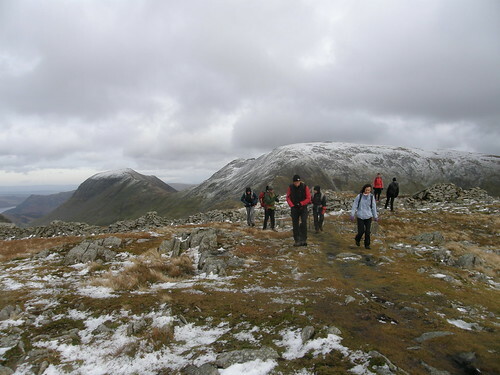 Time for our annual pre-Christmas get-together with friends, this year, for the third year running, at Ninebanks Youth Hostel in the northern Pennines, near Alston. 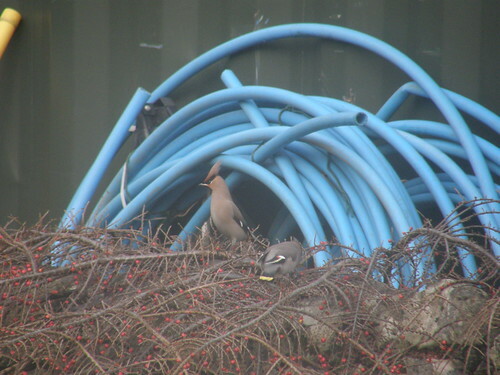 It’s a lovely cosy spot, nestled in a pleasant valley, with great views from the living room windows. Crucially for us, at this time of year it can be exclusively booked by groups, and it has enough bedrooms for each family to bag one of their own. On our last two visits there has been snow and therefore sledging in the field opposite the hostel, and so the kids haven’t wanted to venture too far. 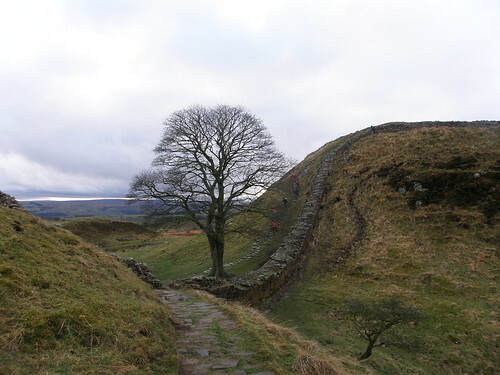 But our friend D has been itching to investigate Hadrian’s Wall and this year, with no snow, he was to get his way. For A and B and I this would be our first return to the Wall after our long(ish) walk along it this summer. 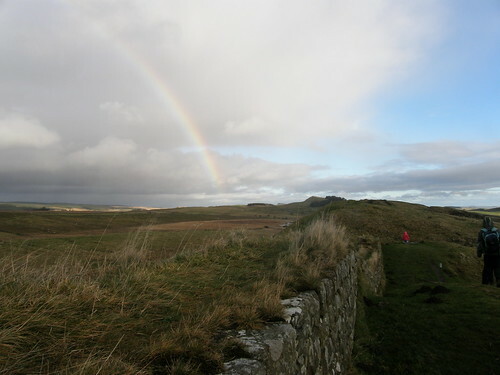 We suggested the section from Steel Rigg car-park along to Housesteads Fort, which includes the walk along the crags above Crag Lough and the climb over Hotbank, and which I remember as my favourite section of our summer walk. 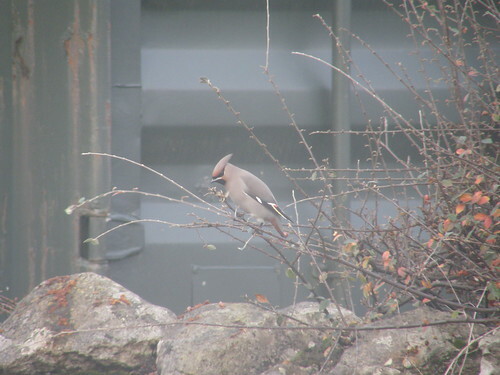 It was a mixed sort of day, some blue-skies and sunshine, but some black clouds and a bit of drizzle too. A rainbow day. 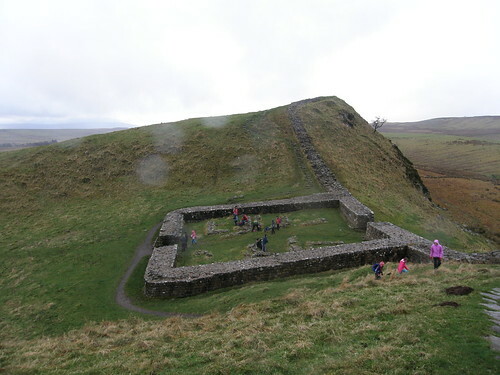 The worst rain shower coincided with our visit to Milecastle 39, where we stopped for lunch. 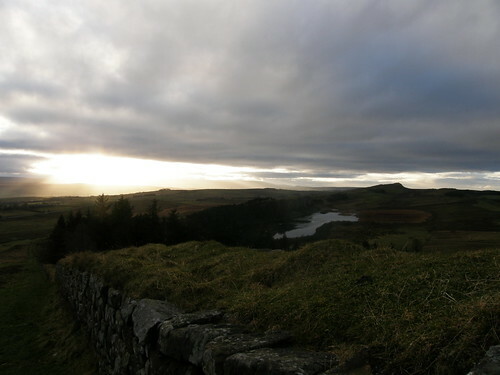 From the cliffs above Crag Lough we watched a roe deer bouncing away through the boggy looking terrain beyond the water. 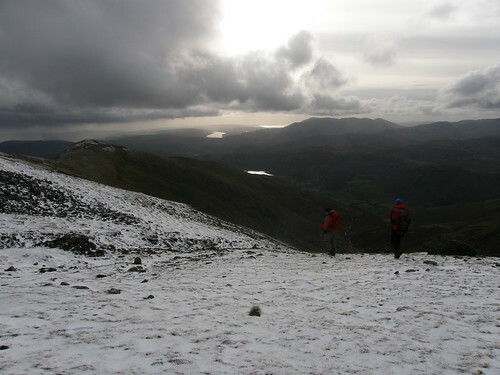 By the time we reached the top of Hotbank, the sun was already low in the sky. 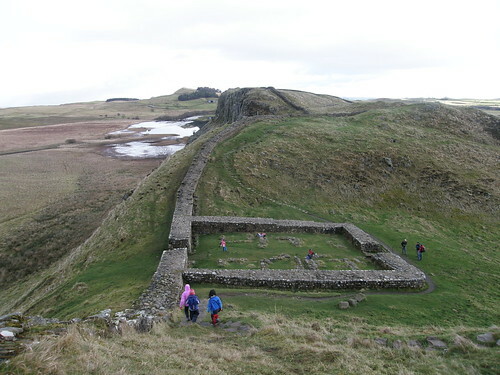 At Housesteads we only really had time for a fairly cursory look around. 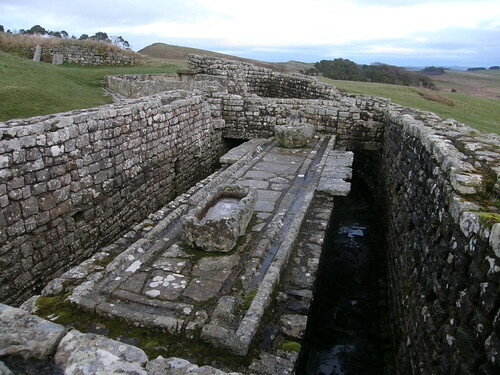 I did manage to find the latrines, which I remember well from my first visit here (circa 1978, on a Geography field trip/holiday with school), but which we missed in the summer. The kids had almost all of them disappeared into the warmth and shelter of the little museum, to dress in Roman style garb and to watch a short film. It was just a short descent from there to where we’d left the cars (thanks to the Madman ferrying the drivers at the start of the walk). Back to the hostel then, and straight into cooking a veggie korma and a chicken rogan josh for a communal supper. I was only slightly hampered by the fact that I’d neglected to bring the recipes with me, but despite my ineptitude it all seemed to go down well – probably due to the healthy appetites everyone had mustered out in the fresh air. A few tipples, a quiz, a few stories rehashed. A great day. Hardly news this, as it happened at the tail-end of last month. 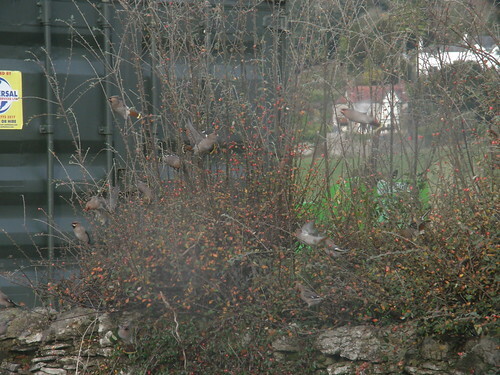 In the centre of the village, close to home: a flock of about 30 waxwings repeatedly swooping down from perches in tall trees to feast on berries from some cotoneaster bushes. I first saw them on a Saturday (several times) and went back on the Sunday morning, when the weather was slightly brighter, to take photos. 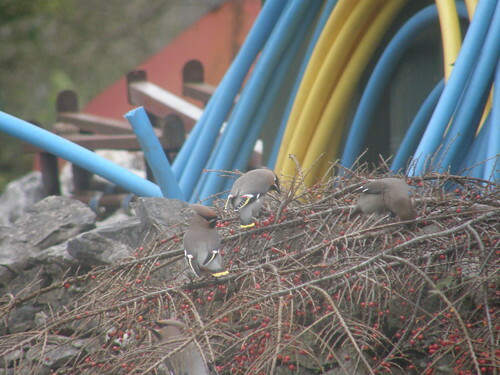 Allegedly, waxwings visit Britain every winter, but this is the first time I’ve ever seen these stunning birds. They’re all hustle and bustle, full of colour and character and very entertaining to watch. Seasoned Beating the Bounds readers (hi Mum!) will know that over recent years I’ve walked in a bewildering variety of footwear: boots, shoes and sandals; new, old and completely dilapidated; Hi-Tec, Keen and Asda. The one thing they’ve all had in common is their total inability to keep my feet dry. Well, now, hopefully, all that has changed. 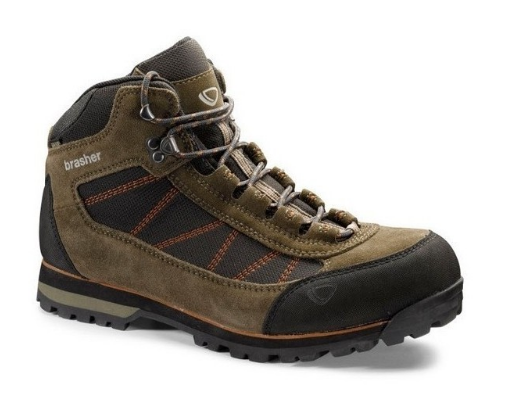 The good people of Outdoorkit kindly sent me a pair of Brasher Kiso GTX to review. I’ve had Brasher boots before, and that previous experience suggested that these would be very comfortable – which they are. I’ve never had a pair of fabric boots however and I shall be interested to see how these compare, and how well they last. I’ve worn them a few times now, but their sternest test to date came on our recent weekend trip to the Lakes. The ground was thoroughly saturated from all the rain we’d been having, and it rained, snowed and hailed. The boots dealt with it all magnificently. 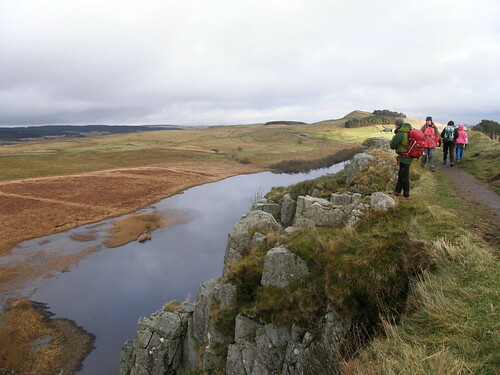 We descended through Blindtarn Moss in the dark and the boots (with my feet in ‘em obviously) were fully immersed in the quagmire repeatedly – I fully expected that my feet would be a least damp when we arrived back at the Hotel – but they weren’t. 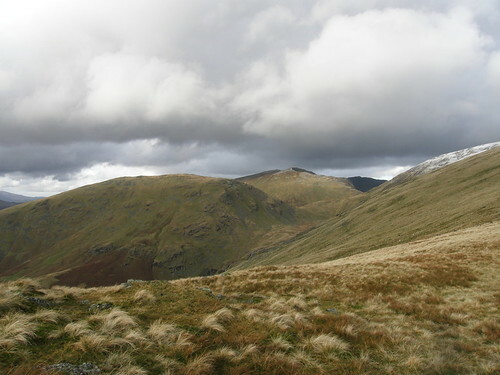 On the second day we descended very steeply on scree, heading from Fairfield to Seat Sandal – I was glad of the grip and support the boots offered, superior I would say, to any of the trail shoes which have been my footwear of choice recently. I shan’t be searching for technical details to regurgitate, I probably wouldn’t understand them and couldn’t swear to their veracity, besides which, if you’re interested, you’ll find them for yourselves. And I’m not in a position to compare these boots to those of any rival producers, but I can at least report that so far I’m really thrilled with them. 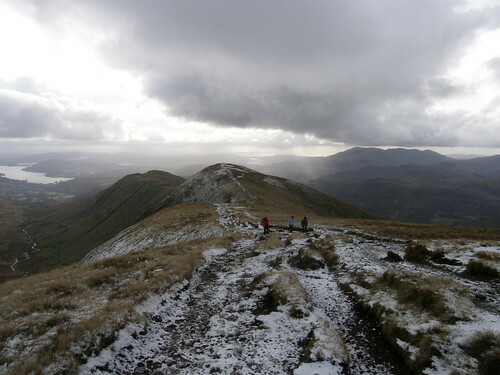 Next test: Pennine bogs – bring ‘em on! 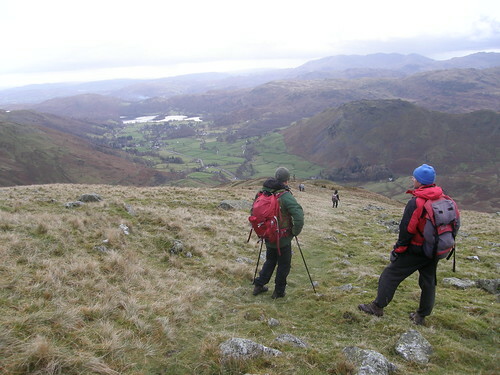 For the second day of our Grasmere get-away we opted for a Fairfield Horseshoe. 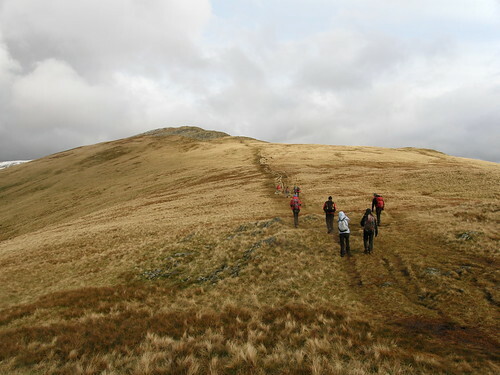 Fairfield throws off ridges in several directions, so there are several viable horseshoe walks which include Fairfield as their highest summit. 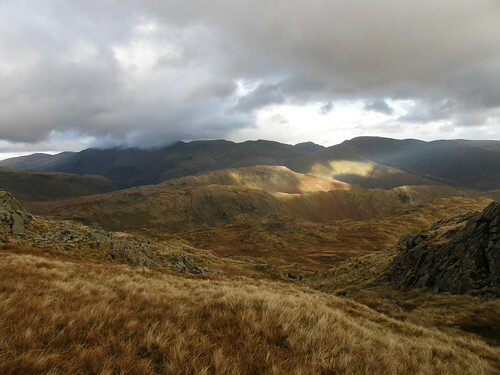 One of those walks is particularly well-known and popular and is often called The Fairfield Horseshoe: since it follows the ridges which enclose Rydal Beck perhaps it should be the Rydal Horseshoe. Anyway, we walked a different horseshoe – not the regular one. 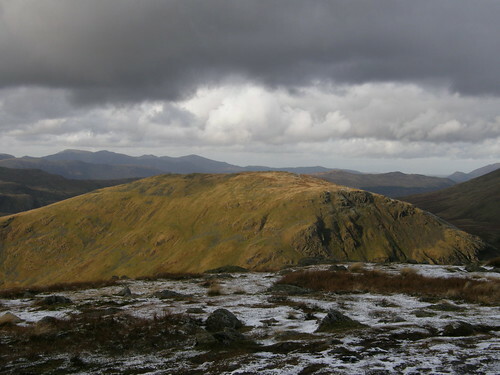 All of this contrasts quite markedly with the hills of the day before, where broad shoulders, knuckled with tors and knolls are more the order of the day. 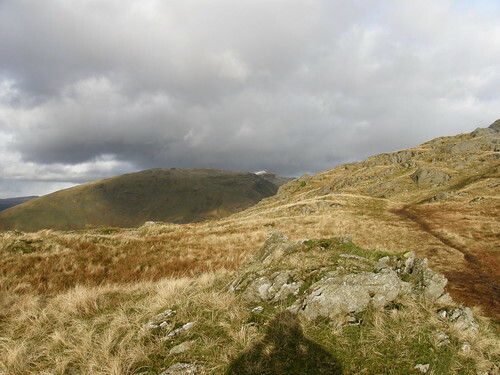 Although the long ridge down to Helm Crag – seen showing-off in the sunshine on the right below – is a notable exception. 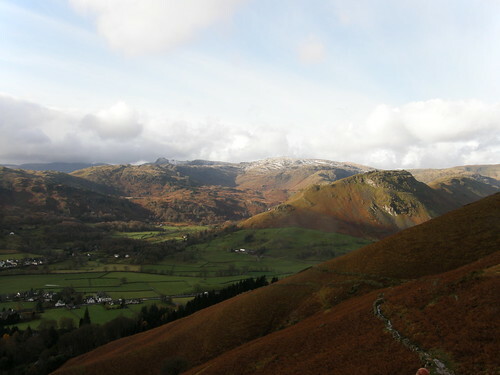 The snowy bulk behind and left of Helm Crag is High Raise. 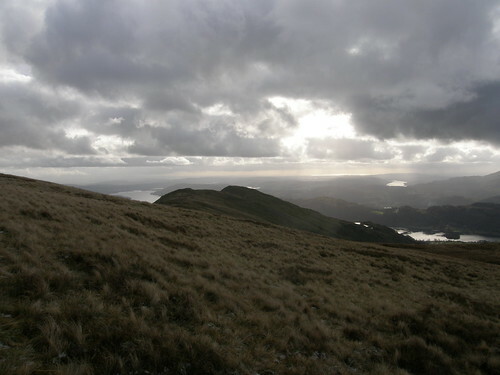 The half-shadowed bowl below and to the left of that contains Easedale Tarn. 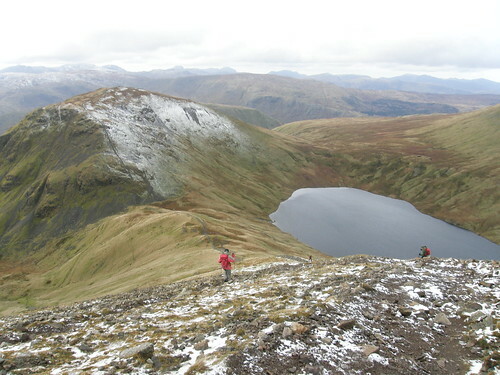 Move down and left again and you will see a second huge scooped corrie – the bottom of this is Blindtarn Moss, which we descended through in the gathering dark the day before. There is no tarn there as far as I can tell – but there is enough water to form one. 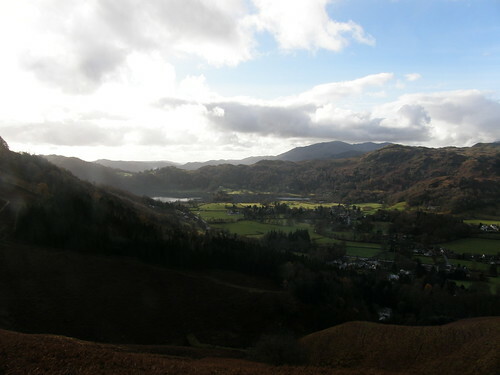 These great views of Grasmere and the hills beyond were occasioned by a steep ascent which eventually led us on to the gentler ridge of Stone Arthur, a Birkett, despite not really being a summit. I’m not sure that November and I will ever truly see eye-to-eye, but even with lots of dark, mean and moody clouds scudding overhead, the low-angled winter light was once again fantastic. 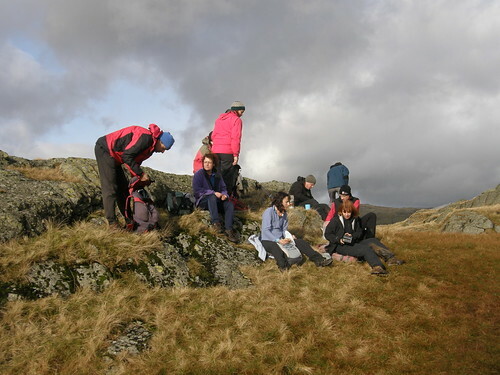 Somehow, inexplicably, the day before I had contrived to quite frequently find myself at the front of our group, or at least not at the back; but on the Sunday normal service resumed and I regained my rightful spot – somewhere off the back. In these circumstances I find a camera often provides a welcome excuse for a breather whilst the waiting whippets up ahead are no doubt grumbling into their buffs about the wind-chill factor. 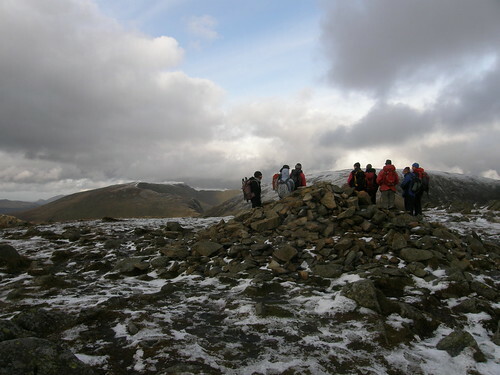 At least from Stone Arthur the ascent was steady onto..
Seat Sandal from Great Rigg. 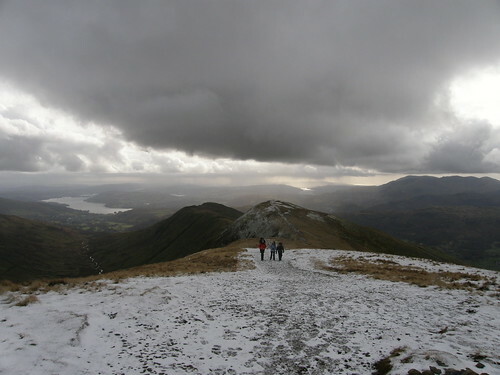 And from Great Rigg the ascent along the motorway of the The Fairfield Horseshoe was also pleasantly steady; all the way to Fairfield itself…. And then a steady plod down the long shoulder back to the Inn and our cars. Another fabulous day to round-off a first-rate weekend. You can put my name down for next year now. 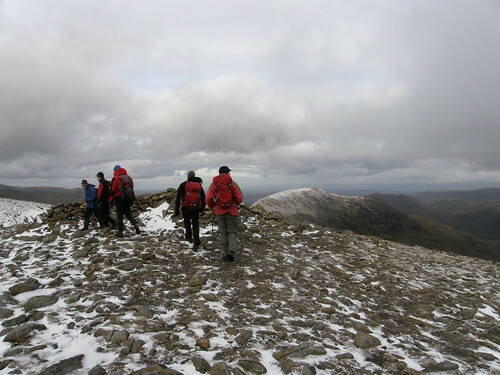 Andy’s account of the day, including useful stuff like maps, distances and amounts of ascent and also entertaining stuff like a musical slideshow, can be found here (sooner or later).